Vilma, warmly known as "Vi", strived to live a moral, upright life. Like all of us we have failures, however she always knew where to turn when she faltered: her faith. In her quest to find a righteous man that would be worthy enough to become her husband, there was only one thing that she could not, and would not compromise...her virginity. Of course this would not be such an easy thing to accomplish. As a ravishing beauty, men were attracted to her like bees to honey! 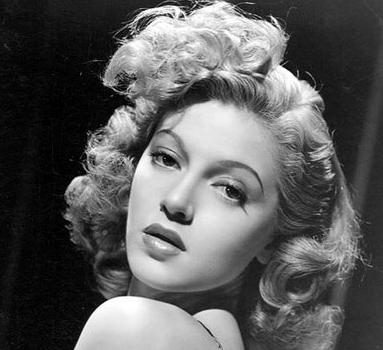 She was a captivating sight to behold at five-foot nine, brown eyes with hints of cinnamon, a well-proportioned hourglass figure, and a natural blonde--with a little help from some peroxide. When she walked down the street men honked, whistled and made the typical cat calls. Remember, this was the 1950’s! 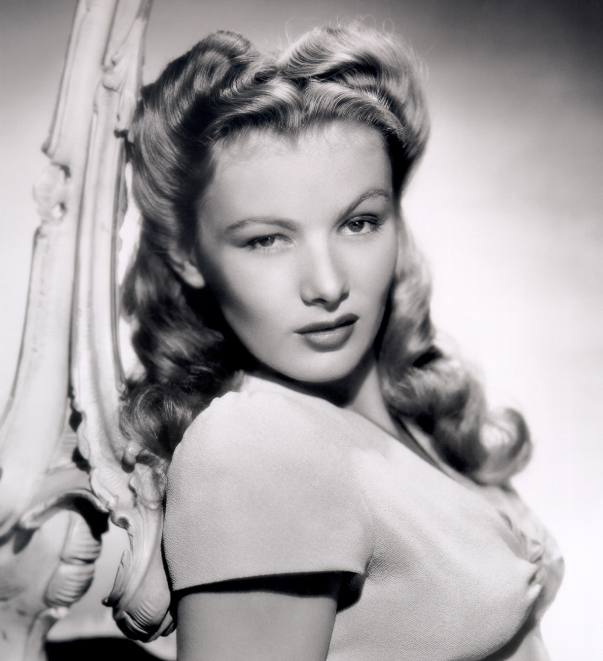 Her looks were even compared to some of the famous movie starlets of the time such as Betty Grable, Lana Turner and Veronica Lake. Why was Vilma “The Unconquerable”? The sub-title that I chose for this blog came directly from one of her own diary entries. After one particular night out on the town, she came home and headed straight to her most secret possession where she wrote of the night’s encounter: Yet another one of her dates was trying his dandiest to persuade her to give in to his desires, but she refused his advances and made it home safely. She ended her diary entry by proclaiming herself as “Vilma the Unconquerable”. Remember, Vilma had already decided she would remain a virgin… and darn it all she was going to keep it that way until she got married. Period! But… ahem… she was far from perfect. Chastity can be a difficult virtue, since our bodies have natural instincts and desires. The Church teaches that these desires are not wrong, but that they should be acted upon only in the Sacrament of Holy Matrimony. Vilma believed this with every fiber of her being. She struggled to overcome these intense temptations that usually came along with dating and was conscious of the fact that they could easily lead her to the point of no turning back. No, she told herself, she would just have to stay on guard and keep herself in check when going out with men. After all, she saw the consequences first hand. 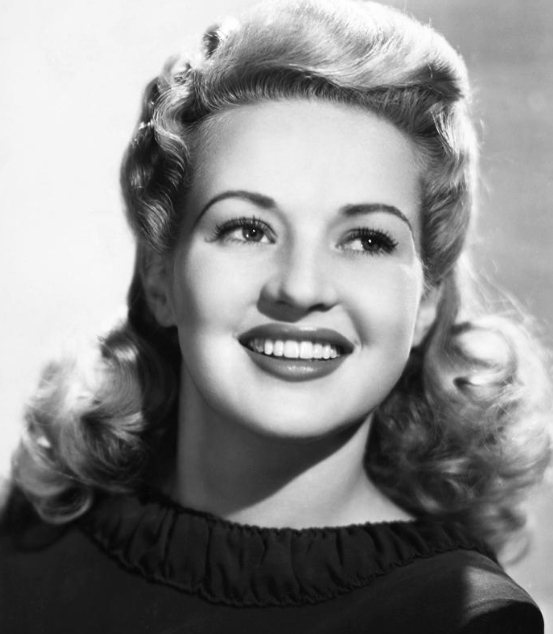 She did not want to wind up like her best friend Betty Jo, who was 17 and pregnant out of wedlock…by a married man! Yes, even in the 1950’s there were such scandals. But she was determined to follow her faith and not let God or her parents down, with all those raging young hormones it would be a challenge though. In 1952, when Vilma was at the budding age of 17, her dating life was still just beginning and being a typical teenager, she was boy crazy! Vilma’s parents instilled in her the teachings of a living a good Christian life and believed their daughter would save herself for marriage. 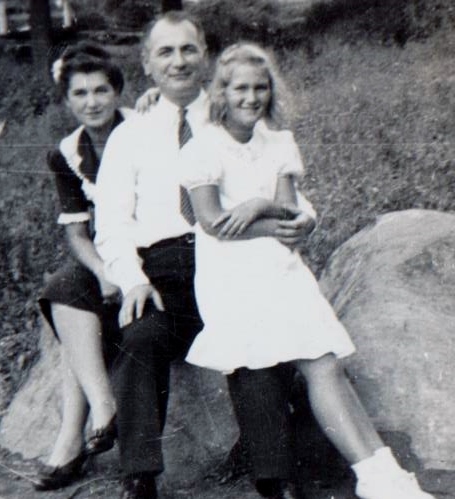 She often confided in her mother and was guided with her sage advice for dating and holding strong to their beliefs, so her parents Michael and Barbara put their trust in her when she went out to paint the town red. At times it seemed like their little house on Esmeralda Avenue was a “Grand Central Station” for men coming to and fro, pulling up in their shiny new Cadillac’s, Ford’s, Buick’s and Chevy’s, all to seek out their daughter’s affections. Vilma got wise to men’s tall tales and mushy love talk pretty quickly though, she knew most of them were up to no good and only wanted one thing! This made her ever more decisive that she would not be 'conquered'. Her greatest desire was to be married and to be married to a good man—but not yet. 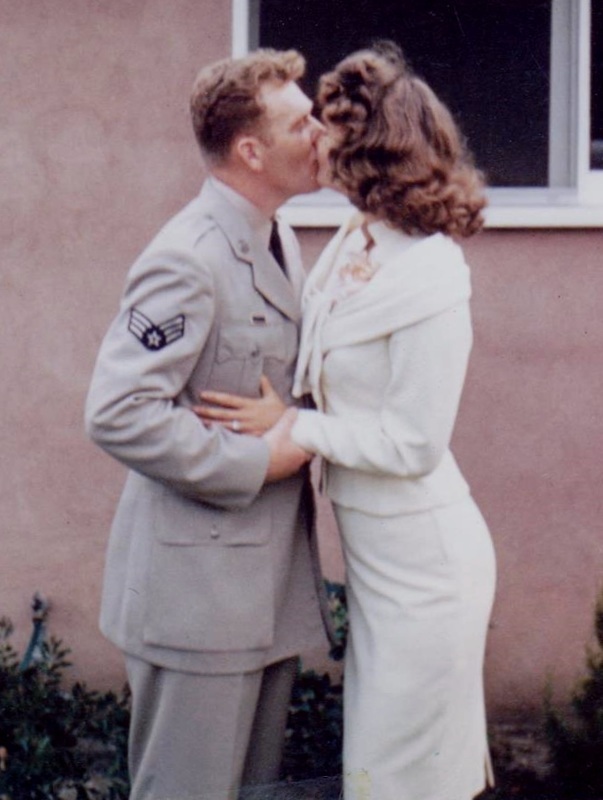 Since Vilma did not want to be tied down to the first man she began dating—she decided early on that she would to take her time in deciding on her husband. She set out on a journey to date all types of men to discover who she was compatible with. She did not discriminate either, dating Hispanics and African Americans, even though interracial dating was a taboo at the time. She was just as open to going out with men that were tall, short, dark hair, light hair, skinny, muscular, businessmen, cops, and most especially her beloved military men. Those uniforms really “did something to her” she always used to say! Hmmmm....and what girl has not said that to herself before? But Vilma did have a preferred male body type. Of course being 5’ foot-nine herself, she enjoyed a man who was 6-foot or taller. When she went out with smaller men, she felt as if she towered over them, sometimes feeling like they were her child. It just felt too awkward for her, especially when she wore heels--which would bring her to almost 6-foot tall herself. She just couldn’t get over being so much taller than a man, again not that she was conceited, but because she was too self-conscious about her own height. She also preferred a man who had a strong, masculine build who was in the military and who just happened to be devout Catholic. She often proclaimed her adoration of red-headed men and secretly hoped she would marry one so she could have red-headed children one day! Where did Vilma meet so many men? In the 1950’s Los Angeles was a tourist mecca, especially for military personnel on leave. Coming in from the port of Long Beach and close by military bases in Northern and Southern California, there was an abundance of fine military men to choose from. Vilma was lucky to meet men from all across the country and from all walks of life. Back then the streets of Los Angeles and Hollywood were far different than today. It was considered generally safe with no serious gangs as of yet, you could even hitch a ride with a perfect stranger and not think twice about it. Vilma even picked up men (mostly military) herself quite frequently! 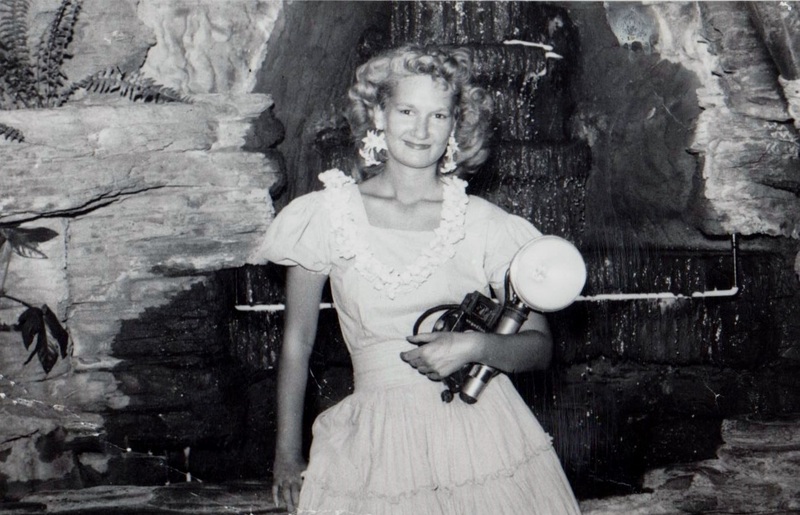 In front of the waterfalls at "The Pacific Seas"
Her dating life quickly accelerated in 1954 while working as a “Camera Girl” at one of the most famous tourist attractions of the time: Clifton’s Cafeteria in downtown Los Angeles. Founded in 1931 by Clifford Clinton, the restaurant included exotic decor and facades that were "kitschy and theatrical". This was really the precursor to themed restaurants such as the ‘Rainforest Café” that we see today, even Walt Disney was inspired by the vision of Mr. Clifton. Vilma worked at two of the locations: Clifton's Pacific Seas on 618 South Olive Street in Los Angeles and Clifton’s Brookdale on 648 So Broadway Street in Los Angeles. The Pacific Seas location was torn down in 1969 and is now a parking lot. However the Brookdale location is still there today and is undergoing a major renovation by a developer who wants to restore it back to its original grandeur. The restaurant was noted for each facility having its own theme, the Pacific Seas being in the Polynesian tropical style and The Brookdale for being designed after a Redwood Forest. Both locations were also known for their fabulously artistic neon lighting. 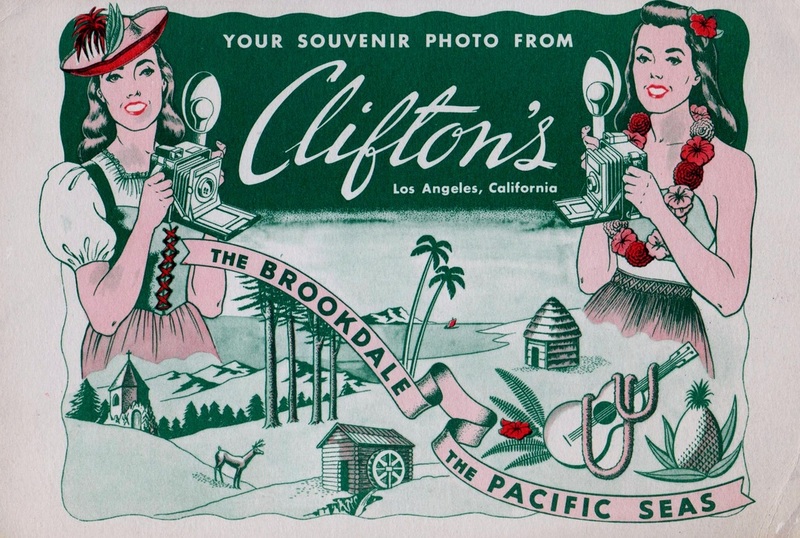 Since Clifton’s Cafeteria was a tourist attraction, one of the services offered was a souvenir picture of your visit. Clifton’s had a team of camera girls on staff, all dressed in “uniforms” which consisted of a peasant style dress and your camera slung around your shoulder. If you worked at the “Pacific Seas” location, you wore a flower in your hair and Hawaiian lei around your neck to compliment the island theme. Vilma was one of the girls who meandered around with her big camera and a large flash attachment, offering a photo of your visit. The charge for each photo was anywhere between $1-$3 dollars. 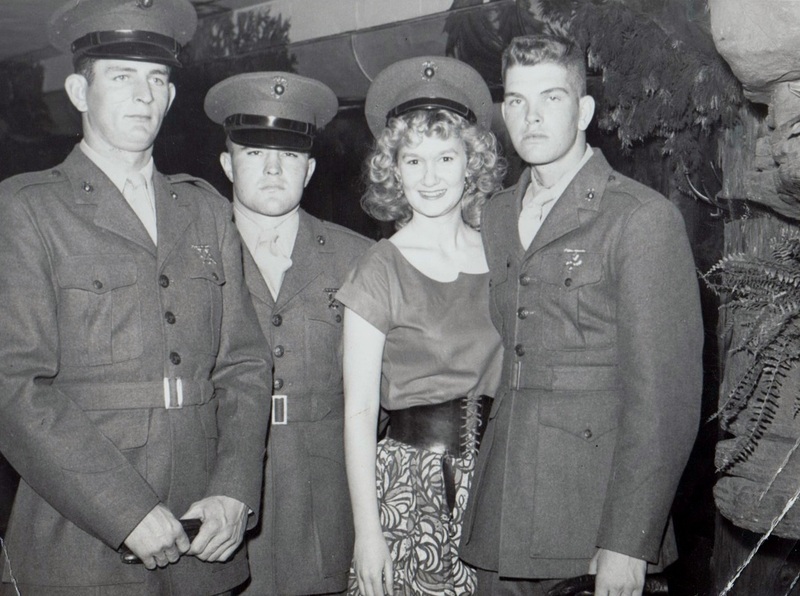 Men, especially young single military men, would always want a souvenir picture with a pretty girl to take home--but mostly to show off to their buddies. Oh the men! It was as if she turned on a faucet of water and men came pouring out. She reveled in the art of flirtation, which in turn led to multiple date offers…and marriage offers too! She was on her feet all day, but it didn’t matter, she was taking pictures and enjoying the night life and hubbub of Old Hollywood and Los Angeles. Her boss gave her a nightly quota that she had to earn, because of her popularity and charm she easily met her goal and then some! The boss praised her as one of the best camera girls at Clifton’s. At some point she even had the great entrepreneurial sense to finally buy her own camera so she didn't have to give her hard earned income to a ‘boss’. 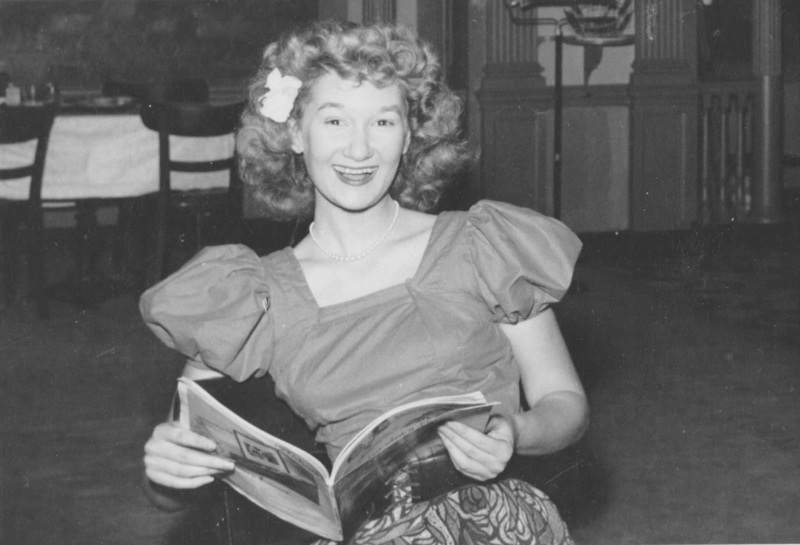 Later she expanded her work as a Camera Girl at other major tourist mecca's such as China Town, The Paris Inn Supper Club and at "The Pike" in Long Beach. As I mentioned before, the pinnacle of this story is ultimately how she met and married the man she was praying for. Remember the ideal man she always dreamed about marrying? That 6-foot tall, red-headed military man who was preferably a devout Catholic? Well, that just happened to be my father Richard. I’ll clue you in: It is through her ‘Camera Girl’ job that they met one dark and lonely night. It is one fascinating and mysterious story in and of itself. It shows how God prepared my father in advance for her and demonstrates once again Vilma’s enduring faith and trust of God. To discover the story, and how Vilma’s Guardian Angel played a role, you’ll just have to Stay Tuned to my blog!